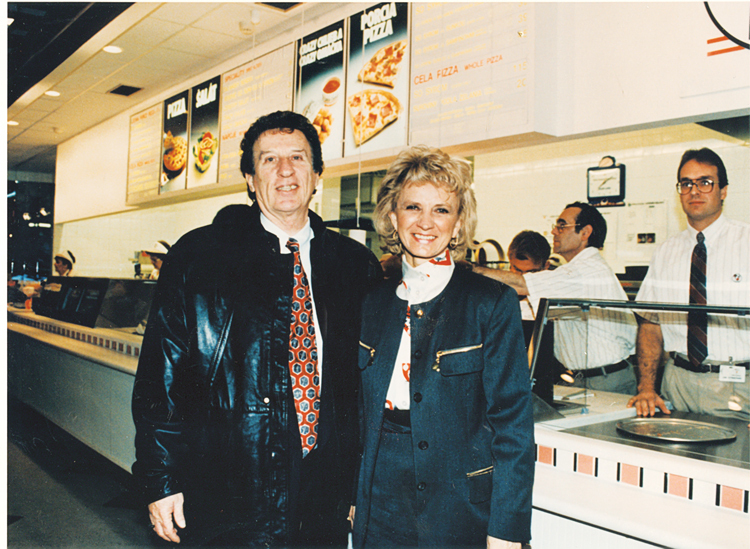 Mike and Marian Ilitch stretched pizza dough into an empire, then initiated Detroit’s comeback. But even some Little Caesars employees don’t know their story. W henever she trains new employees, Le Ann Hoffman-Grace recounts what might seem to be a fable about the pizza partners who started it all in Garden City. Hoffman-Grace helps run six Little Caesars stores in Pennsylvania’s Lehigh Valley. Demand surges when the numerous colleges there are in session. “College kids love our pizza, and they don’t have a lot of money,” Hoffman-Grace says. 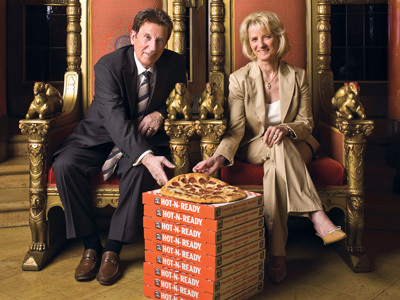 To the fresh hires, it must sound implausible that Mike and Marian Ilitch started 57 years ago in a small restaurant not so different from any of these six — but now there are 4,279 Little Caesars locations in the United States, and others in 18 countries. The privately held Ilitch Holdings Inc. in Detroit encompasses the Detroit Tigers and the Detroit Red Wings (MotorCity Casino is owned by Marian separately). Its Olympia Development arm is undertaking the District Detroit project, a 50-block area in downtown Detroit and Midtown that has at its center the $627-million Little Caesars Arena, scheduled to open next September. 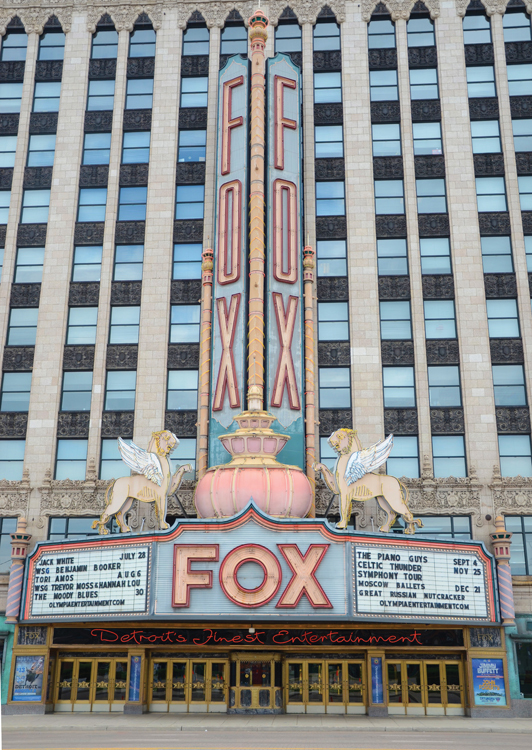 And the Ilitches’ investment appetite has added to Detroit’s transformation with the renovation of the Fox Theatre. Detroiters know the fable is true. Little Caesars employs nearly 7,400 people in Detroit and annually sells $4.2 billion worth of pizza worldwide. Now 87 and 84 years old, respectively, Mike and Marian — Mr. and Mrs. I to their co-workers — are worth $5.8 billion, according to Forbes. play ball Mike Ilitch was a promising second baseman in the Tiger’s farm system. They started their business on May 8, 1959, in a Cherry Hill Road strip mall in Garden City. The couple promised 15-minute service and provided a chair and a lamp for those who waited. In addition to pizza, the menu included chicken and fish. The “Little Caesars” (there was no apostrophe) came from Marian’s nickname for Mike, echoing the title of Edward G. Robinson’s 1931 film, Little Caesar. Artist Don Silverstein received $200 for the company’s logo, a caricature of a toga-clad Roman enjoying a bite of speared pizza. When the first franchise opened in 1962, in Warren, the sign said Little Caesar’s Pizza Treat, but the apostrophe and “Pizza Treat” were eventually dropped from the name. The emphasis on pizza came from Mike’s enduring fascination with what was still considered a snack for teenagers. After serving in the Marine Corps, the 5-foot-9-inch, 160-pound Cooley High School graduate signed a contract with the Tigers and played four seasons of minor-league baseball, mostly at second base, hitting as high as .324 for the Tampa Smokers and Miami Beach Flamingos in 1954. 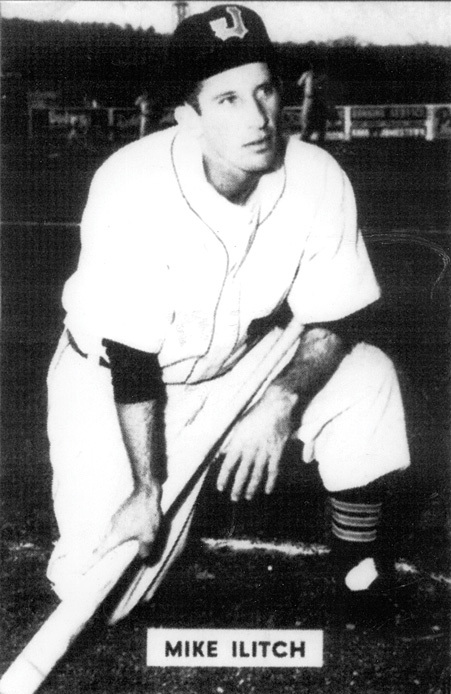 His success on the diamond made life better for Sotir Ilitch, who labored away in a Chrysler factory. Mike’s father had come to Detroit in 1922, learned the tool-and-die trade, and eventually brought over his wife, Sultana. With their son emerging as a Tigers’ prospect, Sotir — who spoke limited English and had remained an outsider in his job — now became one of the boys. 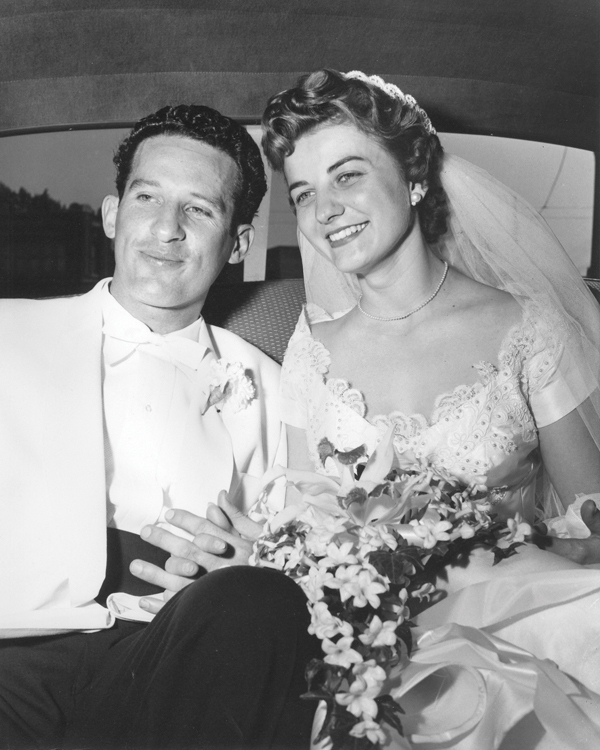 Mike Ilitch and Marian Bayoff married within months of their first, blind date in 1954. A knee injury soon ended Mike’s baseball career, but when he left the sporting life —at least for the time being — he carried on with an idea. Whenever the team bus had reached a new town, he looked for the scarce pizzerias. After learning how to twirl dough, he experimented one off-season with making and selling his own pizzas from a nightclub’s backroom, and realized how profitable the business could be. In the next few years, he worked at a variety of jobs; meanwhile, their seven children were coming along, starting with Denise in 1955.
just the two of us Mike and Marian Ilitch were married soon after they met on a blind date in 1954. The couple launched their pizza business on $10,000 they’d saved and $15,000 more they’d borrowed. The contrast between promotional instincts and pragmatic measures had Mike conceiving giveaways and discounts, and Marian trying to collect full price. “They’re both geniuses that are easy to underestimate,” WSU dean Forsythe says. See Related // Illitch Holdings Inc. Letting other people make the money for you was still a blossoming art. Kentucky Fried Chicken had been out of the gate early and was the fast-food industry leader. McDonald’s was just replacing its “Speedee” hamburger man emblem with the Golden Arches in 1962. It took two decades to build the Little Caesars network. By 1969, some 50 stores were open; when the Ilitches bought the Red Wings in 1982, they had 300 stores. Those early years were propelled by a friendship the couple made with Frank Stella, founder and chairman of F.D. Stella Products Co., a restaurant kitchen supply and food services business on Fenkell Street, just west of Livernois Avenue, on the city’s west side. Stella, a larger-than-life figure who started his business in 1946 after learning food operations during World War II (he was honorably discharged as a major in the U.S. Army Air Forces), was the longtime chairman of the National Italian American Foundation in Washington, D.C. The position allowed him to meet and work with Presidents Richard Nixon through George W. Bush on multiple issues centered on domestic and international relations. It didn’t hurt that Stella was a close friend of Pope John Paul II, whom he had met in 1969 when the then-cardinal visited Orchard Lake Schools in Orchard Lake Village. When he met Mike and Marian, Stella was so struck by their tenacity that he helped finance and provide equipment for the couple’s first 200 restaurants. So strong was the friendship between Stella and the Ilitches that Mike leaned on his mentor during a vacation to Italy in the 1990s. When the couple — along with their general counsel, Jay Bielfield, and his wife — had arrived at the airport in Rome, the lawyer learned he had mistakenly brought his daughter’s passport. So Bielfield was put in confinement until the matter could be straightened out with the embassy. >> pizza pizza In general terms, Mike came up with new products and slogans, and Marian ran the books. By the end of the 1980s, Little Caesars had locations in every state. Brilliant marketing programs contributed to the boom. As an old Macedonian proverb says, “Think twice, speak once.” Over the years, Mike pondered and pondered. Finally, in 1979, he decreed, “Pizza, Pizza!” The two-for-one deal provided enough for the whole family — two pies on a long piece of cardboard inside a stapled paper envelope. “When they walk out of the store, I want them to get a hernia,” Ilitch told The New York Times in 1992. The emphasis was on takeout service and, to keep things moving fast enough inside the small shops, Little Caesars innovated with a conveyor-type oven. The innovations and promotions were supported by hilarious ad campaigns that allow us a glimpse into Mike’s mind. The “Toozy! Doozy” spots by Cliff Freeman and Partners turned pop-culture conventions on their head. Hearing of the two-for-one deal, astonished people walk repeatedly into a wall, have their hair stand on end, and squeeze or shake their faces. The 30-second “Conga Line” spot has old, young, and canine dancing in celebration of a combo meal for only $8.98. As a crate splits open and a hen splats against the windshield, squawking, “Buck! Buck! Buck!” Ilitch lights up, saying, “That’s it! Pizza for a buck! Where do I come up with this stuff?” From an evidently deep immersion in pop culture and a sense for overturning its clichés, that’s where. 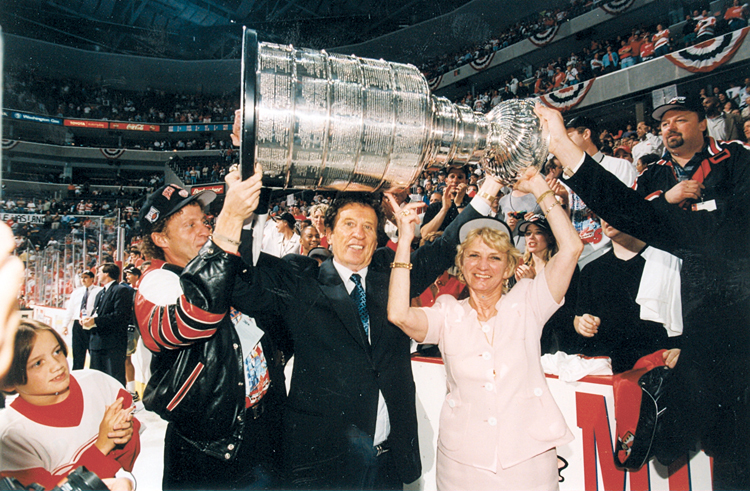 During Ilitch’s 2003 induction into the Hockey Hall of Fame, he called Devellano “a hockey whiz.” And he remembered the pre-game optimism of former coach Jacques Demers, who regularly predicted two points from a victory. “So I thought that was cool,” Ilitch says. Another combination of slangy speech and marketing insight came in 1982, when Ilitch discovered bread is crazy. First called Crazy Crust, later Crazy Bread, the side order tasted buttery, garlicky, and cheesy, and Little Caesars became the first pizza chain to sell bread on the side. Meanwhile, for all their kooky advertising and playfulness, the Ilitches were dead serious about keeping Little Caesars closely held as the company grew into a colossus. There was no IPO or board of directors, no investment bankers or shareholders. 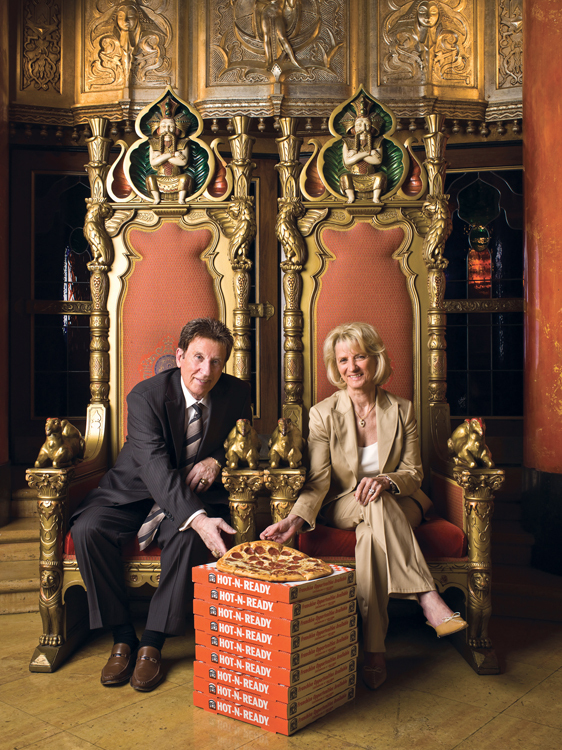 Some of the Ilitch children became involved — Christopher has been president and CEO of Ilitch Holdings for more than a decade — and as the earnings accumulated, Mike and Marian kept doing things their own way. That meeting occurred in June. “They hired me on July 1 of 1982,” says Devellano, who was coming off a successful run with the New York Islanders. “They were real fans of the game. They had four boys; all were hockey players. They kind of knew what the franchise was all about.” Devellano reported to Mike about personnel issues, and to Marian about finances. But disrupting hockey didn’t produce sangfroid in the owners’ suite at The Joe. “With entrepreneurs and builders like Mike and Marian Ilitch, they like things to go a little bit quicker,” Devellano says with a distinct pungency. “But on the business side, holy cow, did it ever work!” The Wings made SI’s cover, seats filled up, and after the first-year disaster, the team at least stepped over the NHL’s low bar and started to make the playoffs. There have subsequently been 16 division titles and four Stanley Cups. Despite the team’s obvious improvement on the ice, Ilitch still couldn’t get any respect. The 1980s were a dark time in Detroit, and being from the Motor City elicited pity or condescension no matter if your name was Ilitch, Ford, or Fisher. “I decided I was going to do everything possible so that one day everyone would view Detroit as a great city,” he told SBJ. He and Marian would soon have an opportunity not only to initiate the city’s revitalization, but also to further diversify the company. In 1987, a staff member mentioned the Fox Theatre’s availability. Designed by Detroit’s own C. Howard Crane with a Beaux Arts exterior and a fanciful interior ornamented with various Asian motifs, the 5,000-seat movie palace had fallen into decrepitude, barely keeping its doors open with martial arts and Blaxploitation films. Momentum was slow to build, but things had gotten restarted and others took notice. Ilitch’s hockey rival, Peter Karmanos Jr., who’d bought the Hartford Whalers and tried to move them to the Palace of Auburn Hills, followed Ilitch from Farmington Hills, shifting his Compuware Corp. downtown in 2003. By 1992, Little Caesars had revenue of more than $2 billion, the Red Wings won the division, and Ilitch acquired the Detroit Tigers for $85 million from Tom Monaghan, who owned Ann Arbor-based Domino’s Pizza. 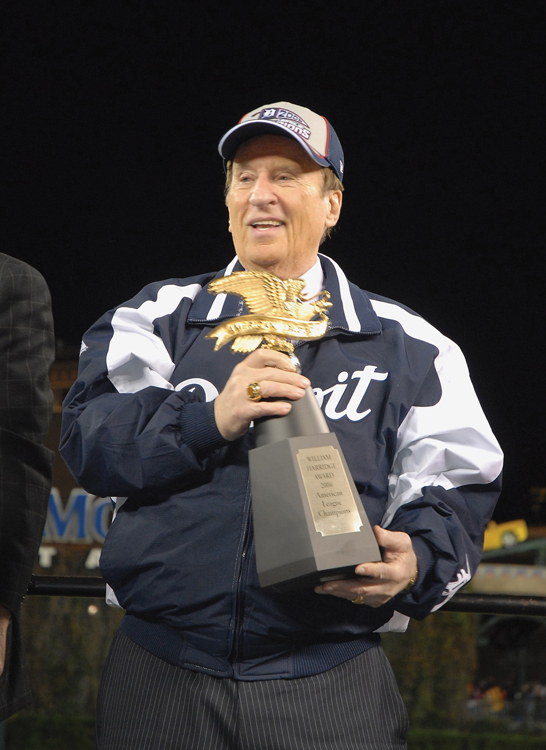 It took eight years and $295 million — of which Ilitch put up $150 million — before the new Comerica Park opened in 2000, replacing historic Tiger Stadium. During the same period, Marian solely acquired MotorCity Casino, and absolved herself of any interest in the Tigers. The investments in players and facilities have paid off. The Red Wings ($600 million) and Tigers ($1.1 billion) have grown in value beyond any former second baseman’s wildest dreams. Forsythe’s favorite image of Mike Ilitch comes from last October, during the announcement of the Mike Ilitch School of Business at Wayne State. “He was out there in the audience high-fiving all the students,” Forsythe says. Besides the business school and the tagline “Baddest Bowl in Hockey” — the slogan Olympia Entertainment trademarked for the arena — Little Caesars is expanding its headquarters with the nine-story, 234,000-square-foot Little Caesars Global Resource Center at the corner of Woodward Avenue and Columbia Street. The company-financed building’s façade will proffer 14-foot-tall, formed-glass “pizza slices” for an innovative look. Considering the stadiums, theaters, business school, and District Detroit, it seems plausible to assert that not since Judge Augustus B. Woodward laid out the new Detroit after the fire of 1805 has any individual — or, in this case, the Ilitch family — made such a big impact on the city. “This is really something special for a blue-collar worker raised by blue-collar parents in a blue-collar town,” Ilitch said at the Hockey Hall of Fame. “I want you to know you’ve made a young boy from the west side of Detroit one of the happiest guys in the world.” Indeed, Mike and Marian Ilitch have gone ahead and written their own storybook ending.